One of the most important—yet often neglected—weed management strategies is to reduce the number of weed seeds present in the field, and thereby limit potential weed populations during crop production. This is accomplished by managing the weed seed bank. What is the Weed Seed Bank, and Why is it Important to Organic Farmers? The weed seed bank is the reserve of viable weed seeds present on the soil surface and scattered throughout the soil profile. It consists of both new weed seeds recently shed, and older seeds that have persisted in the soil from previous years. In practice, the soil’s weed seed bank also includes the tubers, bulbs, rhizomes, and other vegetative structures through which some of our most serious perennial weeds propagate themselves. In the following discussion, the term weed seed bank is defined as the sum of viable weed seeds and vegetative propagules that are present in the soil and thus contribute to weed pressure in future crops. Agricultural soils can contain thousands of weed seeds and a dozen or more vegetative weed propagules per square foot. The weed seed bank serves as a physical history of the past successes and failures of cropping systems, and knowledge of its content (size and species composition) can help producers both anticipate and ameliorate potential impacts of crop–weed competition on crop yield and quality. Eliminating “deposits” to the weed seed bank—also called seed rain—is the best approach to ease future weed management. Over a five-year period in Nebraska, broadleaf and grass weed seed banks were reduced to 5 percent of their original density when weeds were not allowed to produce seeds. However, in the sixth year, weeds were not controlled and the seed bank density increased to 90 percent of the original level (Burnside et al., 1986). Weed seed banks are particularly critical in organic farming systems, which rely on cultivation as a primary means of weed control. Because a cultivation pass generally kills a fixed proportion of weed seedlings present, a high initial population will result in a high density of weeds surviving cultivation—escapes—and competing with the crop. Initial weed population is directly related to the density of seeds in the seed bank (Brainard et al., 2008; Teasdale et al., 2004); thus, effective cultivation-based weed control requires either a low seed bank density (Forcella et al., 1993) or multiple cultivation passes to achieve adequate weed control. In addition, dense weed stands (for example, a “sod” of smooth crabgrass or other grass weed seedlings) can interfere with the efficacy of cultivation implements in severing or uprooting weeds (Mohler, 2001b). Cultivation efficacy—weed kill—can vary considerably based on equipment, soil conditions, weed growth stage, and operator experience. Eighty percent mortality would be considered quite respectable, a level of weed control far less than that achieved with most herbicides. Therefore, without the “big hammer” of selective herbicides to remove heavy weed populations from standing crops, effective measures to reduce weed seed banks become vital for the organic farmer. Whereas the first two kinds of deposits have the greatest influence on future population levels of existing weed species, the latter two can introduce new weed species to the farm—somewhat analogous to opening a new kind of bank account with a small initial deposit and a sky-high interest rate. Even two or three viable seeds or propagules of a highly aggressive new weed species can spell trouble in years to come. Thus organic farmers strive both to prevent heavy deposits through propagation of existing weeds, and to prevent establishment of new weed species by excluding their seed and promptly eradicating new invaders. This topic is discussed further in Keeping New Weedy Invaders Out of the Field. The first type of withdrawal—germination leading to emergence—is, of course, how weeds begin to compete with and harm crops each season. It is also the foremost mechanism for debiting the seed bank, an effective strategy if emerged seedlings are easily killed by subsequent cultivation or flaming (the stale seedbed technique, for example). Even in species with relatively long-lived seeds such as pigweeds, velvetleaf, and morning glory, the vast majority of weed emergence from a given season's seed rain takes place within two years after the seeds are shed (Egley and Williams, 1990). Thus, timely germination (when emerging weeds can be readily killed) can go far toward minimizing net deposits into the seed bank from recent weed seed shed. Knowing when to promote or deter weed seed germination, and how to do so for the major weeds present, are important skills in seed bank management. Weed seeds can reach the soil surface and become part of the soil seed bank through several avenues. The main source of weed seeds in the seed bank is from local matured weeds that set seed. Agricultural weeds can also enter a field on animals, wind, and water, as well as on machinery during activities like cultivation and harvesting (explored further in Keeping New Weedy Invaders Out of the Field). Weed seeds can have numerous fates after they are dispersed into a field (Fig. 1). Some seeds germinate, emerge, grow, and produce more seeds; others germinate and die, decay in the soil, or fall to predation. The seeds and other propagules of most weeds have evolved mechanisms that render a portion (a large majority in some species) of propagules dormant (alive but not able to germinate) or conditionally dormant (will not germinate unless they receive specific stimuli such as light) for varying periods of time after they are shed. This helps the weed survive in a periodically disturbed, inhospitable, and unpredictable environment. Weed seeds can change from a state of dormancy to nondormancy, in which they can then germinate over a wide range of environmental conditions. Because dormant weed seeds can create future weed problems, weed scientists think of dormancy as a dispersal mechanism through time. Figure 1. Fate of weed seeds. Inputs to the seed bank are shown with black arrows and losses with white arrows. Figure Credit: Fabian Menalled, MSU Extension, Montana State University. Maintaining excellent weed control for several consecutive seasons can eliminate a large majority of the weed seed bank, but a small percentage of viable, highly dormant seeds persist, which can be difficult to eliminate (Egley, 1986). Researchers are seeking more effective means to flush out these dormant seeds through multiple stimuli (Egley, 1986). Weed species also differ in the seasonal timing of their germination and emergence. Germination of many species is governed by growing degree–days (GDD)—the summation of the number of degrees that each day’s average temperature exceeds a base temperature. This concept is founded on the assumption that, below the base temperature, the organisms (in this case seeds) are quiescent, and that as “thermal time” accumulates above this temperature, their development proceeds. In addition, some newly shed weed seeds must first undergo a period of unfavorably cold or hot conditions before they can germinate in response to favorable temperatures. This initial, or primary, dormancy delays emergence until near the beginning of the next growing season—late spring for warm-season weeds (dormancy broken by cold period over winter), and fall for winter annual weeds (dormancy broken by hot period in summer)—when emerging weeds have the greatest likelihood of completing their life cycles and setting the next generation of seed. The Iowa State University Cooperative Extension Service has evaluated seed germination response of common weeds of field corn in relation to GDD calculated on a base temperature of 48°F beginning in early spring, and categorized the weeds into germination groups (cited in Davis, 2004). For example, winter annuals like field horsetail and shepherd's purse germinate before any GDD accumulate in the spring; giant ragweed and common lambsquarters require fewer than 150 GDD and therefore emerge several weeks before corn planting; redroot pigweed, giant foxtail, and velvetleaf germinate at 150–300 GDD, close to corn planting time; whereas large crabgrass and fall panicum require over 350 GDD and usually emerge after the corn is up. A few species, such as giant ragweed, emerge only during a short (<3 week) interval, whereas others, such as pigweed and velvetleaf, continue to emerge for an extended period (>8 weeks). Knowing when the most abundant species in a particular field are likely to emerge can allow the farmer to adjust planting dates and cultivation schedules to the crop’s advantage. Several factors other than mean daily soil temperature have a major impact on the timing of weed germination and emergence in the field. Adequate soil moisture is critical for germination, and good seed–soil contact is also important in facilitating the moisture uptake that is required to initiate the process. Thus more weeds may emerge from a firmed soil surface, such as occurs under planter press wheels, than from a loose, crumbly, or fluffy soil surface (Gallandt et al., 1999). For example, densities of common chickweed and common purslane in seeder tracks—in the crop rows—were roughly double those over the rest of the field, whereas annual grass weeds and yellow nutsedge did not show this pattern. (Caldwell and Mohler, 2001). In addition, many weed seeds are also stimulated to germinate by light (even the very brief flash occasioned by daytime soil disturbance), fluctuations in temperature and moisture, or increases in oxygen or nitrate nitrogen (N) levels in the soil. Tillage, which exposes seeds to these stimuli, is therefore a critical determinant of seed germination. The timing of N fertilizer applications can also influence the number of weeds germinating. For example, many weed species can be stimulated by large increases in soluble N after incorporation of a legume cover crop, or inhibited by delayed applications of N fertilizer. Shallow soil disturbance during periods of peak potential germination can be an effective tactic for debiting (drawing down) the weed seed bank (Egley, 1986). This phenomenon is exploited when timely cultivated fallow is used to reduce the weed seed bank, and in the establishment of a stale seedbed prior to planting. These tactics encourage the conditionally dormant portion of the seed bank to germinate so that the crop can be sown into a reduced initial weed population. Weed seeds disperse both horizontally and vertically in the soil profile. While the horizontal distribution of weed seeds in the seed bank generally follow the direction of crop rows, type of tillage is the main factor determining the vertical distribution of weed seeds within the soil profile. In plowed fields, the majority of weed seeds are buried four to six inches below the surface (Cousens and Moss, 1990). Under reduced tillage systems such as chisel plowing, approximately 80 to 90 percent of the weed seeds are distributed in the top four inches. In no-till fields, the majority of weed seeds remain at or near the soil surface. Clements et al. (1996) have shown that soil texture may influence weed seed distribution in the soil profile under these different tillage systems (Fig. 2). Figure 2. Vertical distribution of weed seeds in a loamy sand soil (top) and a silty loam soil (bottom). Figure credit: adapted from Clements et al. (1996) by Fabian Menalled, MSU Extension, Montana State University. Understanding the impact of management practices on the vertical distribution of seeds is important because it can help us predict weed emergence patterns. For example, in most soils small-seeded weeds such as kochia, Canada thistle, and common lambsquarters germinate at very shallow depths (less than ½ inch). Large seeded weeds such as common sunflower have more seed reserves and may germinate from greater depths. Thus, one strategy for managing the weed seed bank, especially for smaller-seeded weeds, is to maintain seeds at or near the soil surface. It is here that seeds experience the greatest exposure to environmental cues that will encourage germination—the most effective means of debiting the seed bank—as well as greater exposure to seed predators (see Encouraging Weed Seed Predation and Decay). Studies have confirmed that some weed seeds, including velvetleaf, morning glory, and pigweed, germinate in larger numbers in untilled than in tilled soil during the first year after seed shed (Egley and Williams, 1990). It may be tempting to use inversion tillage to place seeds below the depth from which they can emerge. This may be an effective strategy for species with short-lived seeds (see below), but it may simply protect longer-lived seeds from mortality factors like seed feeding animals and decomposer fungi, only to be returned to the soil surface by the next deep plowing event. The number of viable seeds remaining from a given year’s weed seed return declines over time as a result of germination (successful or fatal), predation, and decay. The percentage remaining declines in an approximately exponential manner, similar to the decay curve for a radioactive chemical element—the time for the number to decline by 50% is roughly the same, regardless of the initial num. The half-life of weed seeds varies widely among weed species; for example, hairy galinsoga and some annual grass weeds, such as foxtail species, last only one to a few years, whereas some curly dock and common lambsquarters seed can last over 50 years. 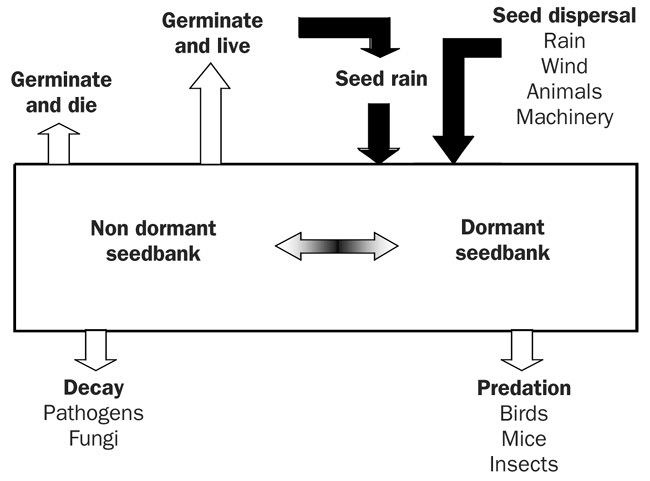 The actual seed longevity in the soil depends on an interaction of many factors, including intrinsic dormancy of the seed population, depth of seed burial, frequency of disturbance, environmental conditions (light, moisture, temperature), and biological processes such as predation, allelopathy, and microbial attack (Davis et al., 2005; Liebman et al., 2001). Understanding how management practices or soil conditions can modify the residence time of viable seeds can help producers minimize future weed problems. For example, seeds of 20 weed species that were mixed into the top 6 inches of soil persisted longer in untilled soil than in soil tilled four times annually (Mohler, 2001a), which likely reflects greater germination losses in the disturbed treatment. On the other hand, a single tillage can enhance the longevity of recently-shed weed seeds, because buried seeds are usually more persistent compared to those left at the surface where they are exposed to predators, certain pathogens, and wide fluctuations of temperature and moisture. However, soilborne pathogens may also contribute to attrition of buried seeds, even in large-seeded species like velvetleaf (Davis and Renner, 2008). Although seed longevity of agricultural weeds is a cause for notoriety, and a proportion of the population may remain viable for several years or decades, most of the seeds of many weed species will either germinate or die shortly after being dispersed from the parent plant. The seeds of many grasses are particularly short lived. For example, in a field study conducted near Bozeman, MT, wild oat seeds were incorporated into the top four inches of a wheat–fallow field, and approximately 80 percent of them died during the first winter (Harbuck, 2007). It is important to note, however, that postdispersal survival varies widely among weed species. A little effort in understanding your weed seedbank [sic] can give you valuable information about what weeds to expect in a given growing season, weed density, and when most weed germination will take place. To get a weed preview, you can germinate weeds indoors as you’re waiting to plant. For summer annual weeds, such as velvetleaf, foxtail, lambsquarters, and pigweed, March–April is a good time to sample weed seedbanks [sic] in the North Central region. Using a soil probe or a garden trowel, take 20 samples to a 2” depth in a ‘W’ pattern from the field you’re interested in. Place the soil in a pie dish, put in a warm place (> 65 º F) and keep moist. Within one to two weeks, you should have an idea of what weeds will be emerging in your field as the soil warms. For a more representative sampling, collect sufficient soil samples to fill several pie dishes, or a seedling flat. The larger the sample, the more closely the observed weed emergence will reflect field populations. Keep in mind that this method is not likely to reveal all the species present in a field. However, in combination with field observations on seasonal patterns of weed emergence, greenhouse weed emergence tests can help anticipate when control tactics are likely to be needed in the coming season, and to begin developing a seed bank management strategy. Kill weeds before they set seed—before flowering to be safe, because some weeds (such as hairy galinsoga) can mature seeds from flowers that are pollinated before the weeds are pulled or severed . If in doubt, attempt to thresh the seeds from the fruits or flowers of flowering weeds; dough-consistency and firm seeds can be considered mature and should be removed from the field if possible. Control creeping perennial weeds before they can form new rhizomes, tubers, or other propagules. Keep crops ahead of the weeds—small weeds overshadowed by a good crop canopy may have less than 1% of the seed forming capacity of vigorous individuals growing in full sun. Walk fields to remove large weed escapes before they flower. Getting the largest 10% of individuals can reduce seed production by 90% or better. Mow field margins to minimize seed set by weed species that have the potential to invade fields. (Balance this with the potential role of field margins as beneficial insect habitat). Mow or graze fields promptly after harvest to interrupt weed seed production. Utilize good sanitation practices to prevent introduction of new weed species into the field, and remove new invaders before they propagate. Another measure that can help contain seed bank populations is to increase the diversity of crop rotations. Although data on the effects of crop rotations on weed seed banks in organic systems have not been consistent, there is some evidence suggesting that more diverse rotations, especially those that include one or more years in red clover, alfalfa, or other perennial sod crops, can help reduce seed inputs from velvetleaf and other annual weeds, and promote seed bank declines through seed predation and decay (Davis et al., 2005; Teasdale et al., 2004; Westerman et al., 2005). Till or cultivate to stimulate weed seed germination at a time when the seedlings can be easily knocked out by additional cultivation or flaming (stale seedbed), or will be freeze-killed before they can reproduce. Rolling after tillage can further enhance germination by improving seed–soil contact. If practical, time this tillage or cultivation to take place when seeds of the major weeds present are least dormant, and/or during the season of the weeds' peak emergence, in order to maximize the seed bank withdrawal. Time crop planting to facilitate destruction of flushes of weed seedling emergence. For example, if the major weeds in a given field are known to reach their peak emergence in mid May, delay corn planting until end of May to allow time to remove this flush prior to planting. Maintain habitat for weed seed predators—vegetation or mulch cover—in at least part of the field for as much of the year as practical. Reduce or avoid tillage during critical times for weed seed predator activity. If a significant weed seed rain has occurred, leave weed seeds at the surface for a period of time before tilling to maximize weed seed predation. Because soil microorganisms can play a role in weed seed decay, maintaining a high level of soil biological activity through good organic soil management might be expected to shorten the half-life of weed seed banks. In addition, incorporation of a succulent legume or other cover crop may either stimulate weed seed germination by enhancing soil nitrate N levels, or promote weed seed or seedling decay as a result of the “feeding frenzy” of soil microorganisms on the green manure residues. However, the potential of these practices as weed seed bank management tools requires verification through further research. While it is sometimes advantageous to cause weed seeds to germinate, it is important at other times to keep them quiescent long enough for the crop to get well established. Several practices can help reduce the number of weeds emerging in the crop. Cultivate at night or with light shields over the cultivation implement to minimize the light stimulus to weed seeds. Leave a loose soil surface after planting or cultivation to reduce seed–soil contact for near-surface weed seeds, thereby deterring germination. If practical, cover newly seeded rows with loose soil to reduce within-row weed emergence. Minimize soil disturbance at or near the time of planting. Do major tillage in fall or very early spring several weeks before planting. Use flame or very shallow cultivation to prepare the seedbed. Avoid practices that result in early pulses of nitrogen that may stimulate weed emergence. Use split N fertilizer applications and slow releasing forms of N, such as compost and legume–grass cover crop mixtures) to make N availability patterns over the season match N needs of the crop rather than the weeds. Avoid planting crops in fields with heavy populations of weeds with similar life cycles. For example, fields dominated by late emerging summer annual weeds might best be planted in early crops like peas. Time crop planting to take place well before the most abundant weed species in the field are expected to emerge. Time crop planting to take place after the expected major weed seedling flushes, and remove the latter by shallow cultivation or flame weeding. Invert the soil to a depth from which weed seeds cannot emerge (most effective for weeds with small, short-lived seeds). Incorporated green manures or surface residues of cover crops can reduce the establishment of small-seeded weeds through allelopathy and/or physical hindrance. Thus, these practices can provide a measure of selective weed control for transplanted or large-seeded crops, which are tolerant to the stresses imposed by cover crop residues. This selectivity does not apply to small-seeded, direct sown vegetables like carrots and salad greens, which are at least as sensitive to these cover crop effects as small-seeded weeds. Remember that none of these strategies can be expected to eliminate the weed seed bank, and also that you may need to change seed bank management strategy as the seed bank itself changes. The reason the weed seed bank is so difficult to manage is because it contains not only many seeds, but many different kinds of seeds, with typically 20 to 50 different weed species in a single field. In other words, the grower may have to deal with 20 to 50 different plant survival strategies! Thus, there will almost always be some weeds that tolerate, or even thrive on, whatever combination of seed bank management strategies the farmer adopts. For example, some but not all weed species have light-responsive seeds, and dark cultivation reduces emergence only in the light responders. Similarly, careful nitrogen (N) management can reduce problems with nitrate responders but have no effect on nonresponders and could even favor a weed that is well adapted to low levels of soluble N. The best approach to weed seed bank management is to design your strategy around the four or five most serious weeds present, then monitor changes in the weed flora over time, noting what new weed species emerge as the original target weed species decline. Then change your seed bank management strategy accordingly. Plan on making such adjustments every few years, and if possible, keep a sense of curiosity and humor about the weeds! Brainard, D. C., R. R. Bellinder, R. R. Hahn, and D. A. Shah. 2008. Crop rotation, cover crop and weed management effects on weed seedbanks and yields in snap bean, sweet corn and cabbage. Weed Science 56: 434–441. (Available online at: http://dx.doi.org/10.1614/WS-07-107.1) (verified 23 March 2010). Burnside, O. C., R. G. Wilson, G. A. Wicks, F. W. Roeth, and R. S. Moomaw. 1986. Weed seed decline and buildup under various corn management systems in Nebraska. Agronomy Journal 78: 451–454. (Available online at: https://www.agronomy.org/publications/aj/abstracts/78/3/AJ0780030451) (verified 4 April 2011). Caldwell, B., and C. L. Mohler. 2001. Stale seedbed practices for vegetable production. HortScience 36: 703–705. Clements, D. R., D. L. Benoit, and C. J. Swanton. 1996. 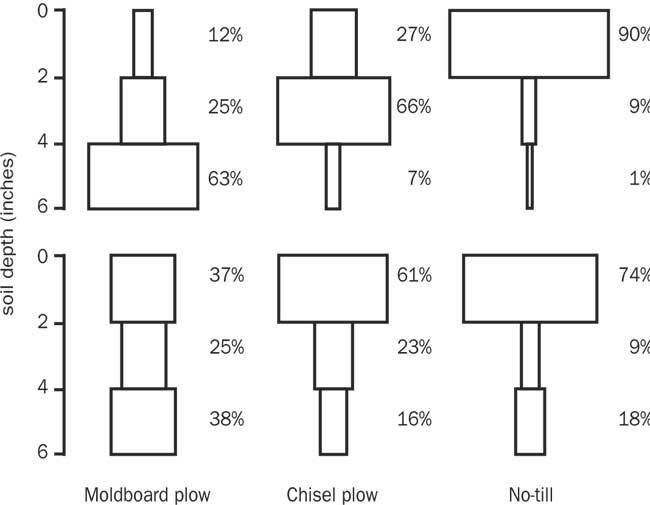 Tillage effects on weed seed return and seedbank composition. Weed Science 44: 314–322. (Available online at: http://www.jstor.org/stable/4045684) (verified 23 March 2010). Cousens, R., and S. R. Moss. 1990. A model of the effects of cultivations on the vertical distribution of weed seeds within the soil. Weed Research 30: 61–70. (Available online at: http://dx.doi.org/10.1111/j.1365-3180.1990.tb01688.x) (verified 23 March 2010). Davis, A. S. 2004. Managing weed seedbanks throughout the growing season [Online]. New Agriculture Network Vol. 1 No. 2. Davis, A. S., J. Cardina, F. Forcella, G. A. Johnson, G. Khttp://eorganic.info/node/2806/editegode, J. L. Lindquist, E. C. Lusheri, K. A. Renner, C. L. Sprague, and M. M. Williams. 2005. Environmental factors affecting seed persistence of annual weeds across the US corn belt. Weed Science 53: 860–868. (Available online at: http://dx.doi.org/10.1614/WS-05-064R1.1) (verified 23 March 2010). Davis, A. S., and K. A. Renner. 2006. Influence of seed depth and pathogens on fatal germination of velvetleaf (Abutilon theophrasti) and giant foxtail (Setaria faberi). Weed Science 55: 30–35. (Available online at: http://dx.doi.org/10.1614/W-06-099.1) (verified 23 March 2010). Davis, A. S., K. A. Renner, and K. L. Gross. 2005. Weed seedbank and community shifts in a long-term cropping systems experiment. Weed Science 53: 296–306. (Available online at: http://dx.doi.org/10.1614/WS-04-182) (verified 23 March 2010). Egley, G. H. 1996. Stimulation of weed seed germination in soil. Reviews of Weed Science 2: 67–89. Egley, G. H., and R. D. Williams. 1990. Decline of weed seeds and seedling emergence over five years as affected by soil disturbance. Weed Science 38: 504–510. (Available online at: http://www.jstor.org/stable/4045064) (verified 23 March 2010). Forcella, F. 2003. Debiting the seedbank: Priorities and predictions. p. 151–162. In R. M. Bekker et al. (ed.) Seedbanks: Determination, dynamics and management. Aspects of Applied Biology 69. Association of Applied Biologists, Wellesbourne, UK. Forcella, F., K. Eradat-Oskoui, and S. W. Wagner. 1993. Application of weed seedbank ecology to low-input crop management. Ecological Applications 3: 74–83. (Available online at: http://www.jstor.org/stable/1941793) (verified 23 March 2010). Gallandt, E. R., M. Liebman, and D. R. Huggins. 1999. Improving soil quality: Implications for weed management. p. 95–121. In D. D. Buhler (ed.) Expanding the context of weed management. Food Products Press, New York. Harbuck, K. Z. 2007. Weed seedbank dynamics and composition of Northern Great Plains cropping systems. MS Thesis. Montana State University, Bozeman, MT. Menalled, F. 2008. Weed seedbank dynamics and integrated management of agricultural weeds. Montana State University Extension MontGuide MT200808AG. (Available online at: http://www.msuextension.org/publications/AgandNaturalResources/MT200808AG.pdf) (verified 11 March 2010). Teasdale, J. R., R. W. Magnum, J. Radhakrishnan, and M. A. Cavigelli. 2004. Weed seedbank dynamics in three organic farming crop rotations. Agronomy Journal 96: 1429–1435. (Available online at https://www.agronomy.org/publications/aj/articles/96/5/1429?highlight=JmFydGljbGVfdm9sdW1lPTk2JnE9KGF1dGhvcjolMjJUZWFzZGFsZSUyMikmcT0oam91cm5hbDphaikmbGVuPTEwJnN0YXJ0PTEmc3RlbT1mYWxzZSZzb3J0PQ%3D%3D) (verified 4 April 2011). Westerman, P. R., M. Liebman, F. D. Menalled, A. H. Heggenstaller, R. G. Hartzler, and P. M. Dixon. 2005. Are many little hammers effective? Velvetleaf (Abutilon theophrasti) poplution dynamics in two- and four-year crop rotation systems. Weed Science 53: 382–392. (Available online at: http://dx.doi.org/10.1614/WS-04-130R) (verified 23 March 2010).